If you are like me, capacity constraints have a tendency of sneaking up on you. And when they do, suddenly everything you do is hamstrung by the capacity limit you never even knew existed. Ignorance in this case, seldom is bliss. The same happened with my Nokia 5800, which led to this post. The Nokia 5800 comes with two storage options - the C drive (Phone memory) and the E drive (Memory card). The Memory card is the bigger storage, and Nokia bundles in an 8GB card with the phone. The problem however is the C drive or the phone memory. A fresh install will give you a tad more than 80MB, but you seldom get that in actual usage. Which is what makes it crucial to maximize the amount of phone memory you have to ensure the device does not let you down when you need it the most. Here are a few things you could do to make sure you have the most memory available on the phone. Install new applications on the Memory card: Fairly obvious, but as you get and install new applications on the phone, choose "E: Memory card" during installation. 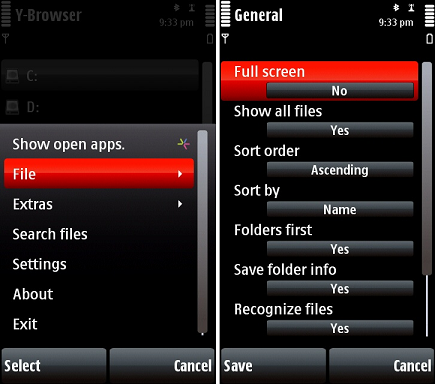 There are of course some applications (mostly from Nokia) that don't play nice and do not let you choose. Nothing much you can do there, other than to see if you can live without them. Remove any applications installed on Phone memory: Go to the application manager in the phone settings at Settings > Application mgr. > Installed apps. Applications installed on the Phone do not have SD card icon next to the application. Make sure you have the installable of the application handy before you uninstall it by choosing Options > Uninstall > Yes. Of course, there will always be some applications and components that need to be installed directly on the Phone and cannot be installed on the memory card. Delete the emails content from the Messaging client: If you are using the standard messaging client (The one that does both SMS and email) for email, then deleting the emails (and attachments) will free up some memory. Go to any of the email folders setup in the phone and do Options > Delete > Phone Only > OK. This will leave the headers in the phone but delete the email content to free up space. Delete unused mailboxes from Messaging: If there are email accounts setup that you do not want to use anymore, delete them by going to the Messaging application and Options > Settings > Email > Mailboxes, select the Mailbox you want to delete and click Options > Delete > Yes. Change default Messaging drive: You can also configure the standard messaging client to store data on the memory card instead of the phone memory. 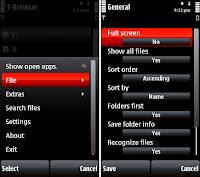 To do this go to the Message client and do Options > Settings > Other > Memory In Use, and select "E: Memory card". Reconfigure mailboxes on Nokia Messaging: You can reconfigure your mailboxes to manage the amount of data in the phone. Go to email.nokia.com, to choose which folders are synced with the phone. In the section "My email addresses" click on the link "Edit settings". In the section " Mail folders to sync" un-check the folders you do not want to access from your phone. To make sure that the phone is updated, open the Nokia Messaging application (This is different from the regular Messaging application with an icon that looks like the @ sign). Go to Options > Tools > Settings, and click the General Tab > Reset data. This re-loads all data in the email, but without the folders you have un-checked previously. Of course be warned that this make take a while. Configure Ovi Store to install on the Memory card: You can configure Ovi Store to install directly to the Memory card. Open the application and go to Options > Account > Settings > Installation Preferences, to set it to the Memory card. Clear downloads folder: Your download folders is probably set up on the memory card. Then it is not going to impact your Phone memory, but in the event that is not the case, make it a practice to delete the downloads as soon as you are done using them. Go to the standard File Mgr and go to C: Phone memory > download, select the downloaded files and delete them. Delete temporary & cache folders: You will need to download & install an alternate file manager like the Y-browser to do this. Once you have it installed you should be able to see and delete the following folders. C:\System\cache (This is the browser caches), C:\System\dmgr (This is where temporary files are stored by the browser). Both folders will be recreated the next time you start the phone browser. Next drop into the two temporary file locations C:\System\temp & C:\temp and delete any files you see in there. Clear Google Maps cache: Google maps downloads and stores a bit of data on your phone, depending on how much you use it. To reset the data cache in Google maps, start the application and go to Options > Tools > Reset, to get back some of that. Do a hard reset of the phone: This is a drastic step, probably not something you want to do unless the situation is dire and none of the steps above have helped. The site allaboutsymbian.com has a guide to perform a hard reset - follow it and good luck. And that hopefully should get you some space back on your Phone memory, as it did mine. There is always a phone, that comes out a little after you buy your own phone that makes you regret your own purchase. It is but a fact of modern life. Looks like this is the phone that is going to do that to me :).